YOUR CHANCE TO WIN WITH THE GRADUATE MAGAZINE! Queen’s annual magazine for alumni of the University – The Graduate – was distributed worldwide to over 137,000 graduates in October. Showcasing news from alumni and highlighting developments around the campus, two lucky readers of this issue stand a chance to win an overnight stay (for two) in a 4 star city centre hotel. Commenting on the prize draw, Editor Gerry Power (LLB, 1982) said: “Two lucky graduates of Queen’s are each going to win an overnight stay for 2 in a 4 star Belfast city centre hotel, plus a restaurant voucher and tickets to two of Belfast’s top tourist attractions, all courtesy of Visit Belfast. 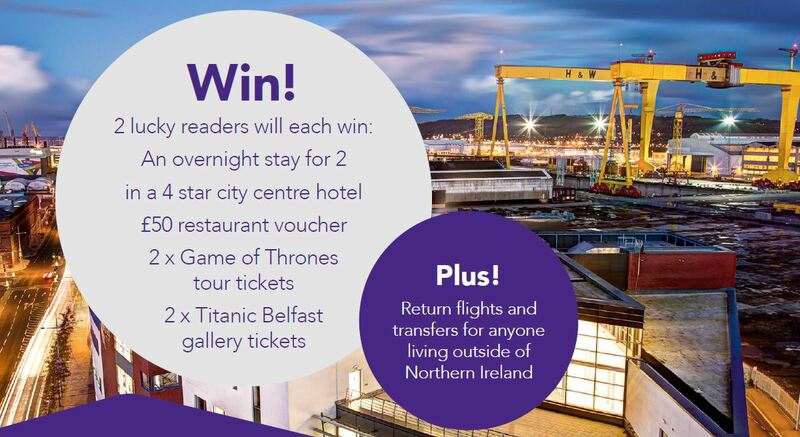 “And if either of the winners come from outside Northern Ireland/Ireland, return flights are also included! Visit Belfast (formerly Belfast Visitor and Convention Bureau) is a public/private sector partnership funded and supported by Belfast City Council, Tourism Northern Ireland and the private sector. It is the official tourism marketing agency for the Belfast City region, dedicated to promoting Belfast as a city break, conference and cruise ship destination. The Graduate provides an extensive roundup of life at Queen’s and is instrumental in keeping alumni in touch with their alma mater and – for many – with Belfast and Northern Ireland. In the latest edition, readers are introduced to Queen’s Children’s Writing Fellow, can find out why keeping in touch with Queen’s is becoming ever more important and can read about the impact of the University’s largest ever legacy donation. Alumni who have lost touch with the University since graduating, and who would like to receive a copy of the 2017 issue of The Graduate (or enter the competition) should update their contact details on-line to ensure that they get future issues of the magazine or email alumni@qub.ac.uk to request a copy of this year’s publication. An online version of the Prize Draw entry form can be downloaded here. A copy of the 2017 magazine is available here.